Yes, it’s the usual feast of gifs and OMGLOL, but they have stumbled upon a point. The Emperor’s New Groove is so unlike any other Disney animated film, that I often have to remind myself that it’s Disney. In the first place, it’s not a musical. Not really. There’s a quick song at the beginning, reprised at the end, but otherwise it’s remarkably capable of establishing characterization without bursting into song. This is just before PIXAR took charge of all non-musical Disney films, so it’s noteworthy that they even tried this. In the second place, it’s spirit is snarky, silly, and self-aware, in a way that Disney movies almost never are. Sure, you have the occasional Flynn Rider, but most of the time they end up Facing Their Feelings in the third act. The very basic moral lesson of TENG – being a self-absorbed jagoff leads to misery – does not require any real shift in tone. That tone bears far more resemblance to classic 30’s screwball comedies (in fact, the film is classified as such on Wikipedia) than to anything else Disney has ever done. Basically, this is the closed Disney ever got to making a Looney Tunes cartoon. Wikipedia also says the the director, Mark Dindal, was a Disney journeyman who “drastically” altered the script to a comedy after an initial effort to make a traditional Disney animated film called Kingdom of the Sun, “didn’t work out.” He also directed Chicken Little, and so no longer works at Disney. So that might explain that. There are, after all rumors of Boba Fett and Han Solo standalone films. I don’t disagree with these considerations. But I think the sequel trilogy — Episodes VII-IX, will not be those. 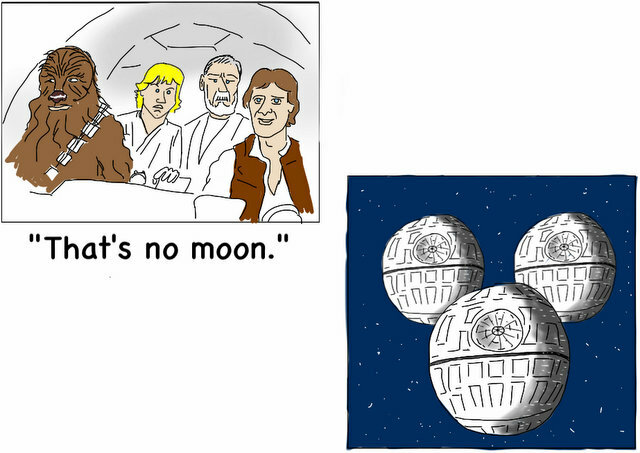 The premise of the Disney sale is that George Lucas is giving Star Wars to the next generation. So I suspect Episode VII will be precisely that handoff. If the rumors are true and Harrison Ford has indeed signed on for the next film, then we are going to see an old Han Solo. If Hammil and Fisher and Billy Dee Williams (admit it, you want to see Lando Calrissian again) return, they will all be old as well. So the smart move will be to set Episode VII thirty years after Return of the Jedi, much as the last Indiana Jones movie was set nearly 20 years after The Last Crusade. And the purpose of this movie will be either to give our aging heroes one last ride, or to mentor the new generation (and probably, both). Then Episodes VII and IX can be about the new generation. Who would this new generation be? Probably the children of the old (Ben Skywalker, Jaina Solo), and some other jedi, rogues, rebels, and villains. Lord knows the Expanded Universe is full of ideas. But I hope they don’t use too much, because I’ve always found the EU that touch too derivative to ever truly entertain. We don’t want to attempt to recreate the old movies, we want to pay homage to them, and move on. Give us a new story, a new villain, a new conflict, against which the old heroes can hardly find the strength to stand. Give us Beowulf against the Dragon, not against Grendel 2.0. Fans of the franchise are certainly skeptical about these new movies after being forced to suffer through Lucas’s bitter meanderings through the universe he inspired. But should they be? While Lucas will remain as a creative consultant, Disney has already shown the ability to produce action packed crowd pleasers for children and adults alike, and their success with trusting Marvel’s Avengers to Whedon was admirable. And really, your childhood can only be destroyed in front of you once. How much worse could it be? It seems that George finally recognized that this thing he’s made is bigger than he is, and that he no longer has the power to control it. That means people who first loved Star Wars, such as Whedon, now have the power to make Star Wars movies. That’s pretty fantastic. On the other hand, The Atlantic doesn’t sound very optimistic at all. On the one hand, George Lucas will have almost nothing to do with any future Star Wars releases. He will not direct, he will not write, he will not even executive produce. He has divested himself of the whole universe. Good for him, and it offers a glimmer of hope that someone who knows something about characters, dialogue and plot will be behind the next saga. Plus, and I hardly dare to whisper this hope, but I feel like some bright young executive at Disney will say “You know, there’s a huge swath of Star Wars fans who still don’t Blu-Rays or DVD’s of Star Wars, because they don’t like the Special Edition. Maybe there’s some money to be made there?” And when Disney wants a Home Video release, Disney gets a Home Video release. On the other hand, it’s Disney. They could be looking to restore SW to it’s former glory, and bring the old disgruntled fans back into the fold. Or they could just be looking to squeeze every last dollar out of this. Which would mean a long series of bland, mediocre space operas neither as good as the originals nor as awful as the prequels, John Carter with light-sabers. Which could eventually bore the hell out of all us screaming nerds, or it could turn Star Wars into a self-perpetuating Series with Eras, a la Dr. Who. Dude, the Seventh Saga totally wails on the Sixth!